Why It's a Good Idea to Have Your Air Ducts Cleaned | Comfort First Heating and Cooling, Inc. The ducts in a home tend to be a collecting place for things like dust since they aren’t cleaned nearly as often as other parts of the house. At first, this has more of an effect on indoor air quality than it does on the operation of the climate control systems. As the dust and dirt builds up inside the ducts, though, it will start to insulate them. This restricts the flow of air through the ducts, making your climate control have to work harder to accomplish the same results. This costs you more money from month to month and makes your home a little more difficult to keep at a comfortable temperature. So, if you haven’t had your ducts cleaned out in a while (or ever) you should schedule duct cleaning services this season. You could help your HVAC systems run much more efficiently, and maybe have an easier time keeping warm in the process. 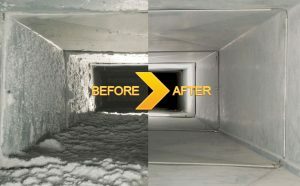 Duct cleaning’s other major purpose is to help improve indoor air quality. Aside from dust, you can end up with pollen, dander, germs, mold spores, and all kinds of other nasty things collecting in the ductwork. The problem with that is that all of those contaminants tend to get blown around the home every time you turn on a climate control system. Breathing in those kinds of high concentrations of contaminants can cause all kinds of health issues, including flu, allergy attacks, asthma complications, and the like. Duct cleaning helps keep your indoor air quality high by removing these contaminants from your home, so you can use your climate control systems without exposing yourself to all kinds of negative health effects. You’ll breathe much better, and hopefully not have to deal with cold or flu issues. If you haven’t had your ducts cleaned before, we hope that this has helped to illustrate why it’s such a good thing to do every once in a while. Contact a professional contractor you trust today and schedule a duct cleaning appointment. You’ll be glad you did. Comfort First Heating and Cooling, Inc. provides a full range of air duct cleaning services in Joliet, IL. If you need any duct cleaning services, contact us today to schedule an appointment with one of our professional technicians. We’ll get your ducts in top condition for the coming heating season.